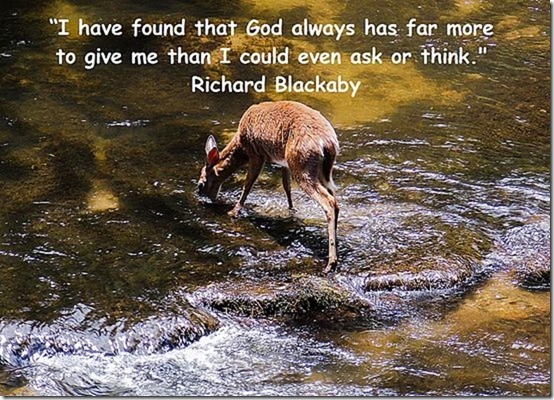 Richard Blackaby in his book Experiencing God wrote in chapter 13 God Speaks Through Prayer. “I have found that God always has far more to give me than I could even ask or think. Paul said, “Now to Him who is able to do above and beyond all that we ask or think— according to the power that works in you— to Him be glory in the church and in Christ Jesus to all generations, forever and ever!” (Eph. 3: 20-21).”* Perhaps I don’t need to tell you he hit a raw nerve and immediately I began thinking how when praying I usually listen to my own voice to ensure I use the right words so God will be convinced of my worthiness to give me what I ask for. Why does it take so long to learn a lesson? I have been praying nearly all my life (and fervently at times too I might add) for the last 45 years and now I find out I’ve been missing out I wonder where I’d be had I read Blackaby’s book years ago. One of the primary lessons I am learning with the Holy Spirit reading Blackaby’s book Experiencing God is how patient God is with me and how He’s always finds a way of giving me just what I need when I need it in spite of myself. And this latest experience/lesson has confirmed to me what I’ve known for a long time, as long as we learn from our mistakes they are not mistakes but lessons. And last be not least God pulls out all the stops when it comes to helping us turn our mistakes into lessons. *Experiencing God by Richard Blackaby page 163, B&H Publishing Group. Kindle Edition.